An off-grid communications tool aimed at the prepper and outdoors market has potential for enterprise disaster planning. Looking for a kit to ramp-up emergency preparedness? A new smartphone add-on may help. Whether it’s hiking or following other noble outdoors pursuits, there’s always been the issue of how to communicate with other people when there’s no phone service—towers tend to be limited in sparsely populated areas. Tools like Family Radio Service, or FRS radios, have limited fidelity; satellite is expensive—I recently wrote about Inmarsat’s cool but expensive new kit; and amateur, or ham, requires an exam and license. One company, goTenna, reckons it has the answer to this outdoorsy dilemma. It plans to produce a simple smartphone radio add-on that bypasses MNOs. If the upcoming device works as promised, it also has potential for business disaster planning purposes in urban environments too. During a phone service outage, for example, employees should be able to emergency chat using their existing, familiar smartphones. 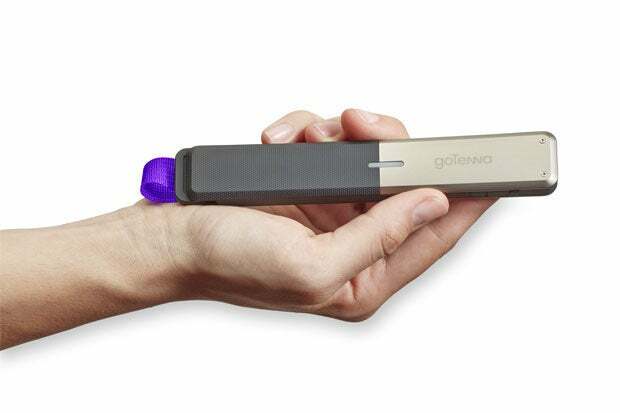 goTenna showed the recently FCC-approved device at the International CES 2015 in Las Vegas earlier this month. goTenna’s device is a small, six-inch-long smartphone add-on gadget that lets users send and receive text messages and send their GPS location via plain old radio waves—no phone service required. Text-based communication has an advantage over classic walkie-talkie use in disasters, partly because it’s a familiar medium, unlike walkie-talkie speech, and is less bandwidth-intensive—you don’t need to listen to wordy diatribes by inexperienced radio operators. Arguably, texting is also less prone to miscommunication than voice. Additionally, automatic message-retry and delivery conformation is helpful during chaos. A water-resistant, 2-oz, baton-like 2-watt radio pairs with a smartphone using Bluetooth, and then communicates with other similarly connected hardware over 151-154 MHz walkie-talkie frequencies. Flash memory stores the messages. An Android and iOS app provides 160-character texting, GPS position sharing, and offline maps. GPS functionality is provided by the phone. Voice calling is not supported. Battery life is 24-hours in continuous use. Charging is through common micro-USB. A shout-out function polls all devices within range. Priority routing is used for emergency broadcasts. It’s worth noting that FRS and amateur radios, which are often used during disasters, are not allowed to broadcast, through their licensing. Theoretically, users are not allowed to use those systems to announce that everyone leave the premises, for example. Suggested goTenna uses include comms in remote areas where there’s no infrastructure, like hiking; areas where there are large numbers of people overwhelming existing infrastructure, such as at a sporting event or music festival; and in a disaster when infrastructure is compromised. Interestingly for enterprise, the device is 224-bit end-to-end encrypted. And for those concerned with increasing hacker activity in our future, it isn’t on the Internet at all. CEO and co-founder Daniela Perdomo, said in a Gigaom interview that the device could also be used by those who want to avoid government intercepts "under repressive regimes." The device uses VHF 151-154 MHz Multi-Use Radio Service, or MURS, which is a short-distance, two-way, FCC-regulated service similar to General Mobile Radio Service and FRS. MURS, though, has better long-distance propagation than GMRS and FRS because it uses lower frequencies. Of course, range is dependent on topography. The manufacturer suggests a city street's environment would allow a half-to-one-mile range, forests two-to-three miles, and deserts four-to-six miles. Elevation would improve those numbers. Remember that this system depends on publicly shared frequencies, unlike exclusive Mobile Network Operator frequencies which are dedicated to the particular MNO. That means you’re sharing the band with other VHF MURS users, which includes alarm companies. However, Perdomo, in the same interview, said that the device can be used by "two people in the Sahara or 5,000 people at Coachella." So it sounds like they've thought of, and hopefully addressed, capacity issues. Radio traffic volume always increases during a large-scale incident. The goTenna devices are sold in two-packs. Current advance-order pricing is $149.99 for a pair. A four-pack costs $289.99 and there are no service fees. The company says it will start shipping to the U.S. in spring 2015.